When Highland Country Club Celebrated it’s 100th anniversary in 2015, the century long history of the club was at the center of attention. Dan Schlarman, Manager at HCC, and a committee of club members has spent several months of gathering stories, photographs and documents a special book is at the printers to document HCC’s first 100 years. Due in early June, the hardcover coffee table book, details the beginnings of how HCC came to existence. First off, it hasn’t always been in it’s current location. The homes on Hartweg Avenue in Fort Thomas sit on what was once part of Inverness Country Club’s 9-hole golf course. Inverness was comprised of less than 25 acres that ran from Memorial Parkway to North Fort Thomas Avenue and over to Southgate Avenue. Some teeboxes are still intact in the yards of houses in the neighborhood! Inverness Country Club was built and incorporated in the 1890s and flourished with a newspaper reporting the club having 400 members in 1903. However, the property was not owned by the club and by 1908 developers sought to divide the parcel up for home sites. The club closed in 1909 and then fire burned the clubhouse on New Year's Day 1910. 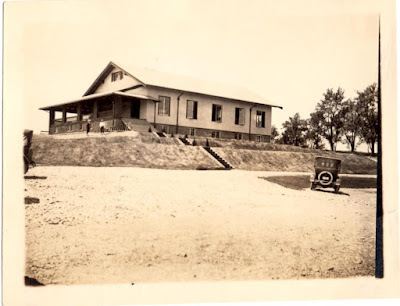 After 5 years of plans being made and then scrapped, the country club moved to the end of the streetcar line on Alexandria Pike in 1915 and was named Highland Country Club because at that time Fort Thomas was knows as the District of the Highlands. The newly constructed clubhouse in 1915. Provided by HCC. Fire affected the club again in 1968 when the clubhouse burned, but by the end of that same year a new clubhouse had been constructed on the original foundation. Members were asked to submit stories and photographs for the book project and Schlarman said many of the photographs came from those the club already had. “We got a great letter from a former caddy who had worked at the club back in the old days and he told some great ‘Caddy Shack’ type stories that we were able to include in the book,” said Schlarman. Funny anecdotes weren’t the only bits of history that were uncovered while researching for this project. Sue Wilmer, who served on the committee that put the book together, was surprised to learn some facts about the club that she hadn’t known before despite being a part of the club for many years. One tidbit from the 1930’s surprised her. The book committee was also able to listen to taped interviews which were done many years ago with members of HCC, to piece together the history for the book. Wilmer remembers HCC as a constant in her family’s life. Wendling Printing in Newport is handling the graphic design and printing of the history. The book which will cost around $60, will be available for sale at Highland Country Club in early June. That second fire occurred just months before I was to have my wedding reception there. I was so disappointed; I loved that old club house, especially the screened wrap around porch! !